I decorated these babies three different ways, because, well I’m kind of a nerd that way. I can’t just do something one way…I need my options. So, let’s get started! First, you want to crumble up a vanilla cake. 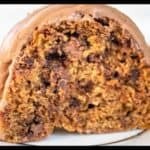 You can either make your own cake from scratch, or use a box mix. Use whatever you fancy. 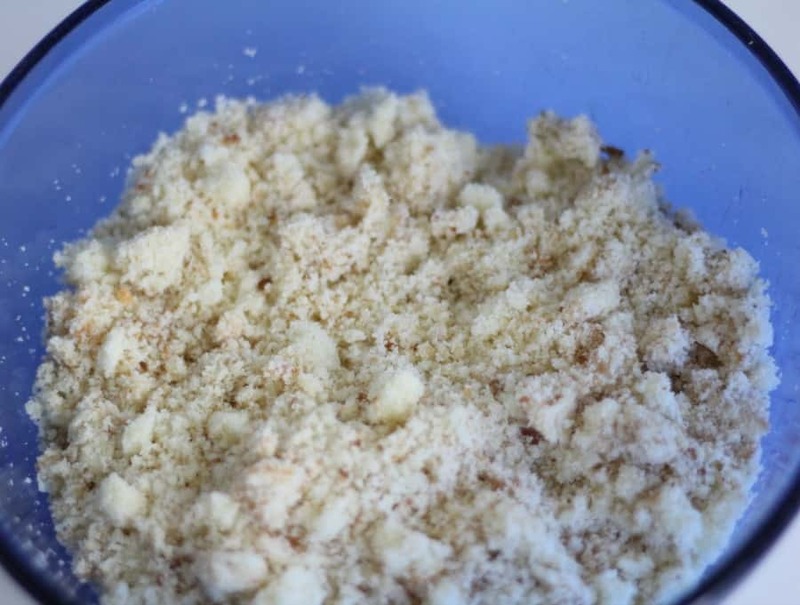 Next, take 4 cups of the vanilla cake crumbs and put into a mixing bowl. Next, crush up your oreos. Either put them in a ziplock bag and use a rolling pin to crush them up, or put them through a food processor. I used my mini chopper because I wanted them to be finely chopped. You want 1 cup of crushed oreos. 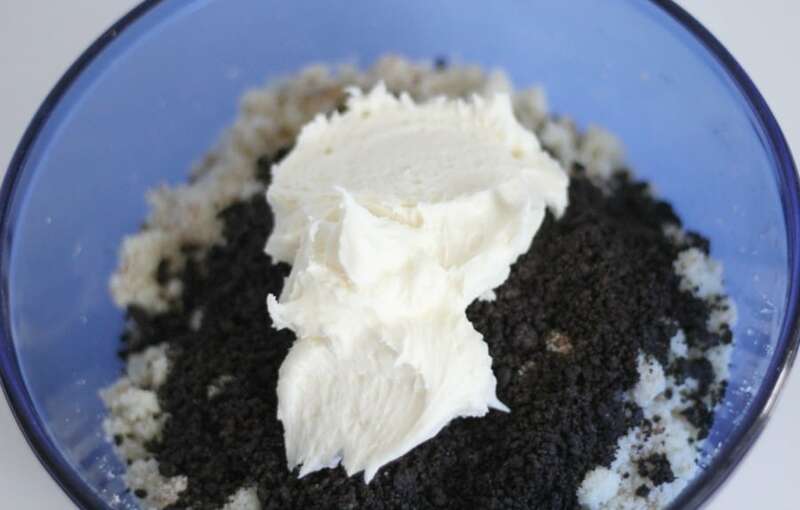 You’ll use only 3/4 cup of crushed oreos in your cake pop mixture. The other 1/4 will be for decoration. 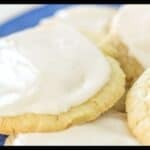 You’ll also want to add a 1/2 cup of vanilla buttercream. 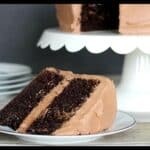 If you need a buttercream recipe, click here for mine…it’s really good. Cover your bowl with cling wrap and chill in the fridge for about an hour. Use a melon baller to dip out balls of the dough and roll them in your clean hands to make balls and set them on a tray. 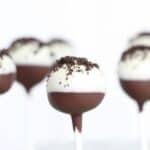 If you’re making cake pops and not using the mini cupcake papers, melt some chocolate and dip one end of your popsicle sticks in the chocolate and insert into the cake balls. Put the cake pops into the fridge while you prepare your chocolate. Now, some cake pop recipes call for candy melts, but I wanted to use actual chocolate for mine. I think it just makes them more flavorful. I used high quality white chocolate chips and semi-sweet chocolate chips. If you don’t like semi-sweet chocolate, you can use milk chocolate. You’ll most likely use one 12 oz bag of white chocolate chips and two 12oz bags of semi-sweet chocolate. Melt your chocolate in separate bowls. I like to transfer my chocolate into tall cups. I use those disposable coffee cups. It just makes it easier to dip the cake pops. For this version, dip the cake pops in semi-sweet chocolate first, then stick them into a piece of foam. Let them set up in the fridge and then dip them half-way in the white chocolate. Before it sets up, sprinkle some of your reserved crushed cookies on top. Stick back into the foam and let them set up in the fridge. 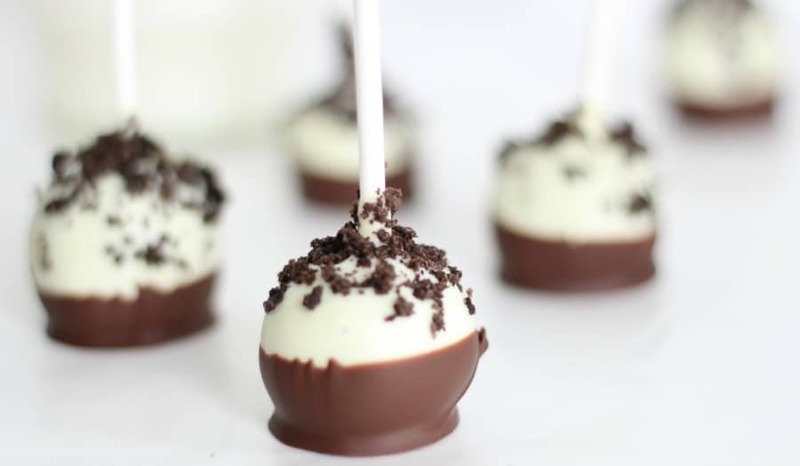 For this second version, dip your cake pops into the white chocolate and sprinkle the bottom side with crushed oreos. Either stick into some foam to set up, or set down (popsicle stick up) on some parchment or wax paper. When the chocolate has set, dip them half way into the semi-sweet chocolate and set down (popsicle stick up) on parchment or wax paper. This method is great if you don’t have foam or a cake pop server handy. This version is probably the easiest and you really don’t need any special supplies like foam, cake pop server or popsicle sticks. You just need some mini cupcake papers. 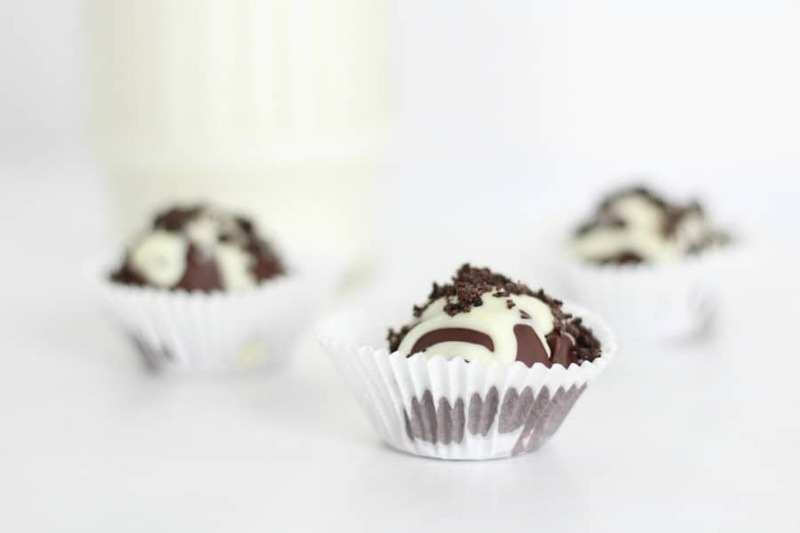 Take your chilled cake balls and using a fork, dip them into the semi-sweet chocolate and set them in the mini cupcake papers. Let them set up in the fridge a bit then take some white chocolate and drizzle onto the top of the cake balls. Sprinkle with crushed oreos. So, that’s the three different versions of my cookies and cream cake pops! You can keep these in the fridge until you serve them. They are also okay to keep in a container on the counter for a couple of days. 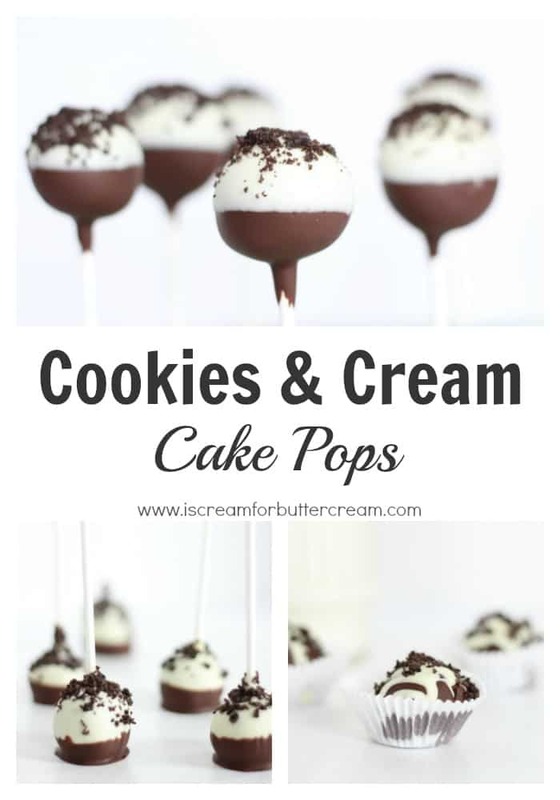 These Cookies and Cream Cake Pops are the perfect combination of vanilla, chocolate, cookies AND cake! Crumble the vanilla cake. Measure out 4 cups and place into a bowl. Add 3/4 cup finely crushed oreos. Add 1/2 cup vanilla buttercream. Mix all together and chill for an hour. Dip the mixture out with a melon ball tool and use your hands to roll into a ball shape. 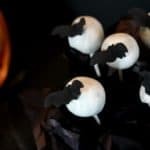 Insert the popsicle sticks first into a little melted chocolate and then into the cake ball and allow to the chocolate to set up. Dip the cake balls in semi-sweet chocolate, allow it to set up, and then dip them half-way into the white chocolate (or vice-versa). 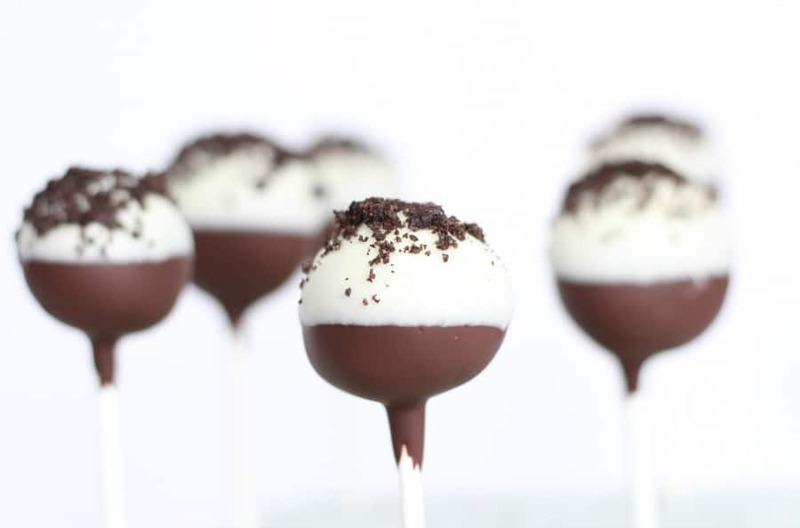 Stick into foam or a cake pop stand and sprinkle with crushed oreos. 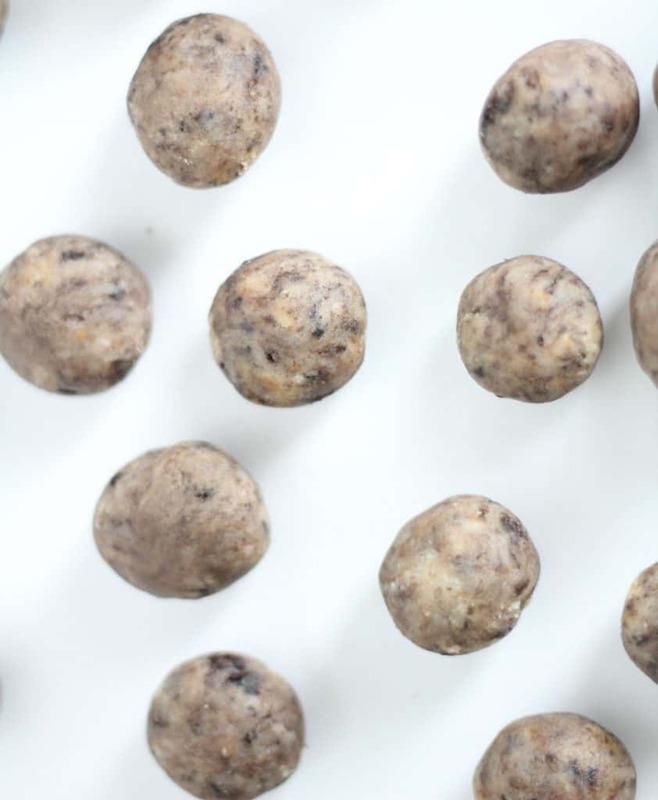 Alternative method: If you don't want to use popsicle sticks, dip the cake balls into semi-sweet chocolate and place into mini cupcake papers. Drizzle with white chocolate and sprinkle with crushed oreos. You can keep these in the fridge until you serve them, or they are also okay to keep in a container on the counter for a day or two.